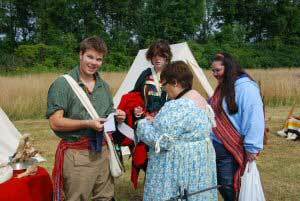 The fascinating heritage and culture of the Métis people will be celebrated at Discovery Harbour with the seventh annual Métis Day Bo'jou Neejee Special Event on Saturday, August 11. The term “Bo'jou Neejee” (“hello friend") is a combination of French greeting “bonjour” and the Ojibway word for friend, “neejee”. Bo'jou Neejee was a common greeting used during the fur trade in Canada. Its native and European origins reflect the strong association between the two groups. Finger weaving, a traditional Métis skill used to create the famous ceinture fléchée (the colourful “arrow sash”), will also be demonstrated. Other exhibits cover the traditional Métis Michif language, commercial fishing, and natural foodstuffs and spices. Enjoy the horse-and-wagon ride to all the activities, including food services at the north end of the historic site. To view PDF files, you will require Adobe Acrobat® Reader. You can download this free software from Adobe's Web site .